Ask eight brewers the key to crafting a great IPA and you will probably get nine different answers. 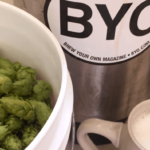 One technique that is well-established in the professional brewing world but just recently gaining traction with homebrewers is hop standing or whirlpool hopping. The Wiz hops to a question on hopbacks and gives the facts of refrigeration. Are IBUs like the Scoville units used to rate chilis? The Wiz gives a cool answer to this burning question. To obtain a big, fresh hop aroma, brewers turn to dry hopping — adding hops in the fermenter. The Wizard dismisses the dangers of dry hopping.